Discover why the Lethabo Estates is rated 5 Stars with our Esteemed Guests! At Lethabo Estate we have something for everyone. Our very different types of award-winning accommodation ranges from R 525 per person sharing bed only to R 2050 per person sharing, bed and breakfast. We also have self-catering or group and family units. Please scroll down to view all the rooms and suites. The Namaste Spa is available to guests and day visitors alike and treatments can also be enjoyed privately in your room or next to the river by special arrangement. We offer gourmet cuisine in our Riverside Restaurant where we offer “Farm to Fork” dining experiences where you will savour our Heritage seed, pesticide-free and free-range fare. For a little glamour, you can also book a special private dinner with a private Fire Dancing show. For courting couples, we also offer gourmet picnic baskets brought to you in the privacy of your room so that you can enjoy the romance of a relaxed evening meal together. The Boudoir Picnic is the ultimate in romance, a lavish affair set up in The Willow Tree Hideaway or The King Fisher River Loft. These beautiful riverside hideaways complete with a Jacuzzi Spa bath, outdoor hammock, petals and beautifully laid picnic table, is for very special occasions. This very special picnic can be enjoyed from Sunday to Thursday. The Luxury picnic is cosy and private, sheltered under a thatch roof and draped with mosquito nets, petals and lanterns, its open-air privacy invites lovers to reconnect in a gorgeous, natural riverside setting. The Gourmet riverside Picnic is set on a mattress with pillows and throws under a waterproof gazebo with curtains that close for privacy is romantic, affordable and a lovely day, or evening out in the country. The Gourmet riverside Picnic is set on a mattress with pillows and throws under a waterproof gazebo with curtains that close for privacy is romantic, affordable and a lovely day, or evening out in the country. We offer Fire Dancing and Hoop Dance lessons for fun, fishing, “Horse Whispering Join Up” and Game drives at the nearby Lion and Rhino Park. We have a 30 km Mountain Bike and Hiking Trail and you could bump into a Wildebeest, Zebra, Kudu, Eland…Brown Hyena! We are close to many attractions and we are a springboard for all sorts of Cradle adventures. 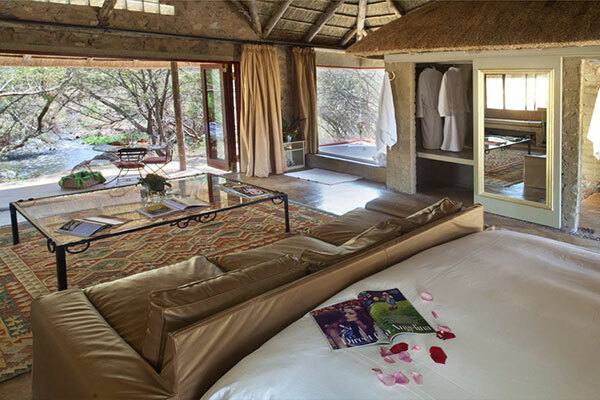 Our gorgeous, private, Willow Tree Bush Retreat is an entirely organic, thatched boudoir. Set on a raised wooden deck under a huge Willow Tree and cocooned in dense reeds, the Willow Tree is on the banks of a quiet stretch of the fast flowing Crocodile River. Indoors a sunken Jacuzzi spa bath, incense, music, movies and decadently romantic furnishings, Persian carpets, plump cushions and mosquito net, set the scene. 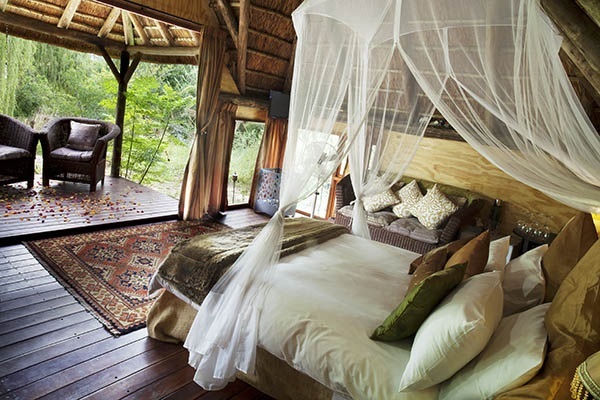 The River Cottage is an absolutely private gem on a beautiful wild stretch of the Crocodile River. This gorgeously furnished stone and thatch cottage has luxurious finishes with Persian & Kelim carpets and two fireplace portable pods which can be moved next to your bathtub, bed or TV for beautiful romantic ambience. 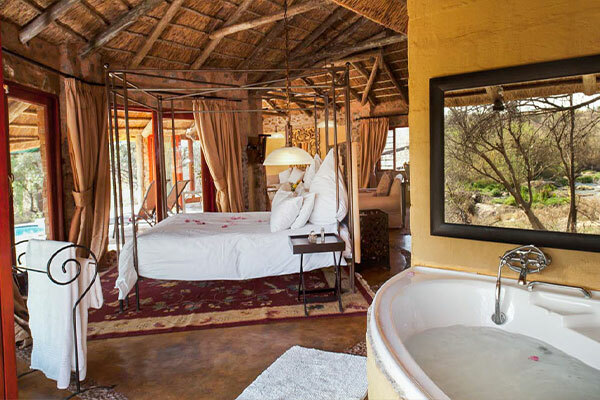 The four-poster bed and Jacuzzi Spa bath all overlook the rapids. 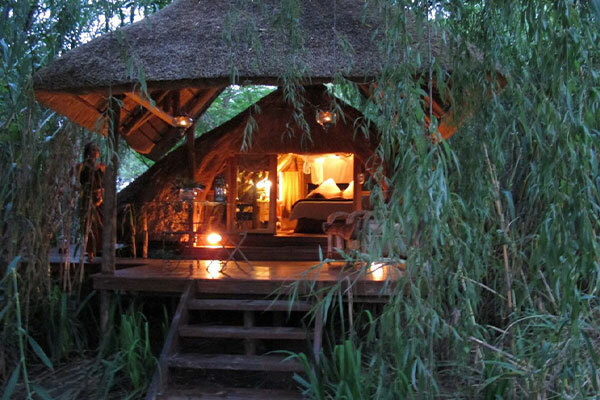 Otters Hide is an absolutely private gem on a beautiful, private, wild stretch of the Crocodile River. This stylishly furnished stone and thatch cottage has music and movies, a large fireplace and a sunken Jacuzzi Spa bath overlooking the rapids. Swim with the otters and chill in comfort in your thatched riverside boudoir picnic spot set below the suite’s deck on the banks of the river. Perfect for a luxurious romantic getaway for two, The Rock Pool Lodge’s private and spacious Luxury Master bedroom flows seamlessly out through wooden folding sliding doors onto a wide covered deck, cocooned by its private the outdoor thatch lapa and beautiful private rock pool and waterfall feature which faces the bed. The Stables Cottage is a spacious and charming suite in a private garden with a beautiful natural rock swimming pool with beautiful waterfall features. Ideal for couples accommodation and for group or family accommodation. Is a spacious and charming suite in a private garden near the Stables. It has 3 rooms.. A cosy en-suite bedroom with the bathroom as part of the bedroom, a lounge, with a fireplace, a kitchen and DSTV lounge area, separate 3rd bathroom which can be used as a 3rd bedroom for a family or parties and then the master bedroom. 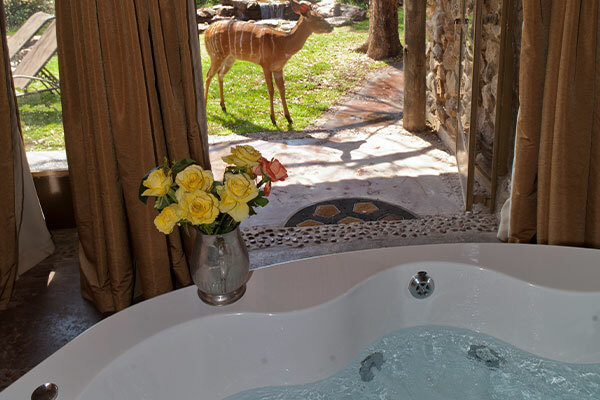 The master bedroom has a fireplace, a freestanding Jacuzzi spa bath which opens out to its private garden with views over the natural pool waterfall feature and of the Rhenosterkop Mountain. It has two fireplaces. Meals can be enjoyed at the riverside restaurant if required and picnics can be arranged at its own private riverside picnic spot. The cost self-catering is R 3650 per night or R 3250 for the weekend or two nights. Sleeps 6 pax, however, is ideal for 4 pax. Restaurant meals and private picnics can be arranged. 4 roomed Lodge comprises a lounge and dining area with a fireplace, leading out to a beautiful outdoor garden area with a rock Koi pond and swimming pool. It has four bedrooms and bathrooms, the en-suite Paddock Room, the en-suite Koi Pond Room and The Loft Bedroom, also with its own bathroom. 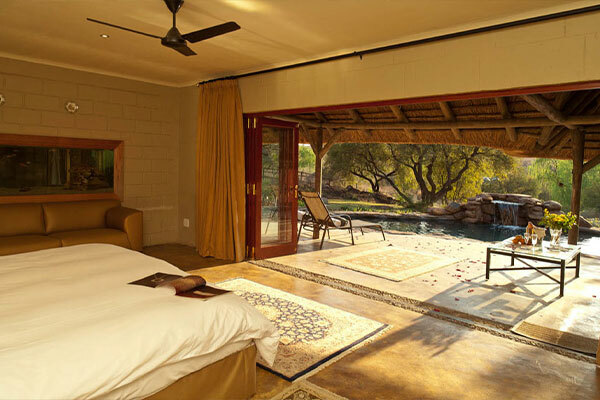 The Rock Pool Lodge’s spacious Luxury Master Bedroom is beautifully furnished and flows seamlessly out onto a wide wooden deck out to its own private rock swimming pool and Koi pond through a huge glass and wood sliding doors. The en-suite bathroom is separated from the bedroom by a large fish tank and glass ceiling through which you can gaze at the night sky whilst languishing in your double Jacuzzi spa bath. For Groups and families, it sleeps 8 at R 8000 per night – For two or more nights the cost is R 7750 self-catering.